By Sean Charlesworth on June 3, 2015 at 11:23 a.m. 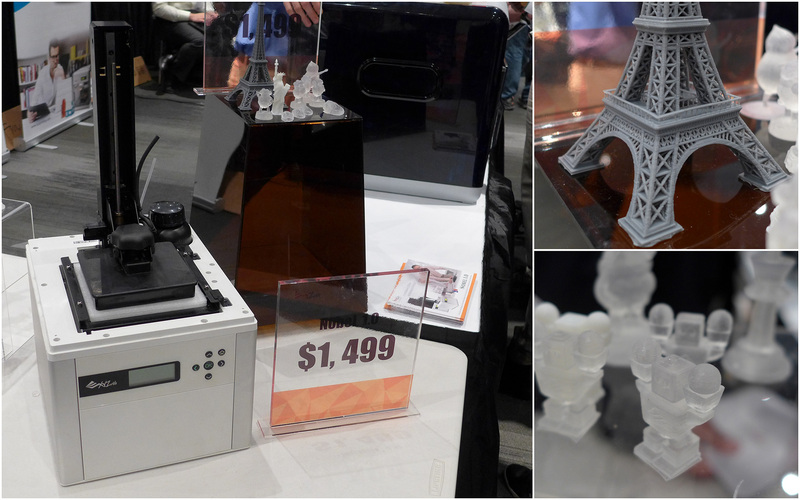 Some interesting products and technologies I saw at the recent 3D Printshow and Inside 3D Printing Expo conferences in NYC. 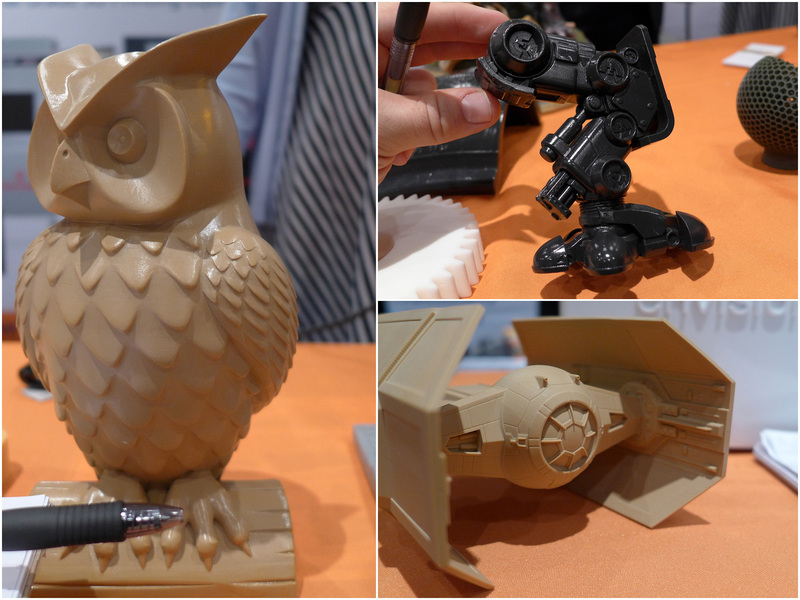 Here's what's new in the world of consumer and professional 3D printing. Hey everyone! Between moving from New York to San Francisco and work on a 3D-printed Space Capsule project, things have been pretty busy for the past few months. 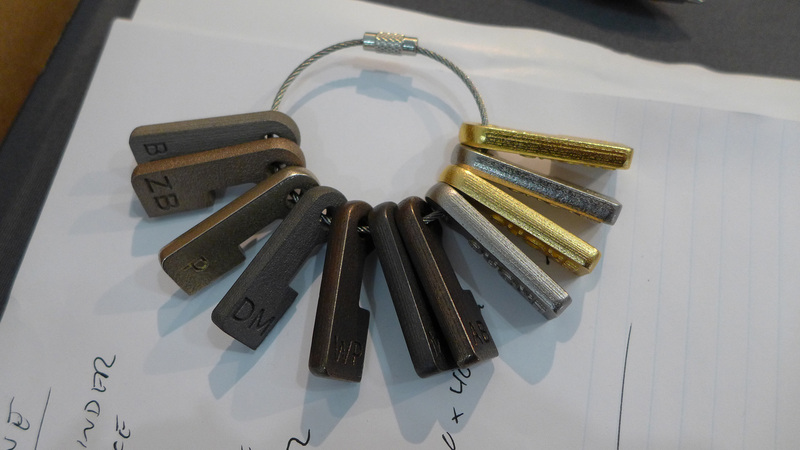 But Bits to Atoms is coming back to Tested, and I wanted to share with you some interesting products and technologies I saw at the recent 3D Printshow and Inside 3D Printing Expo conferences in NYC. Here's what's new in the world of consumer and professional 3D printing. 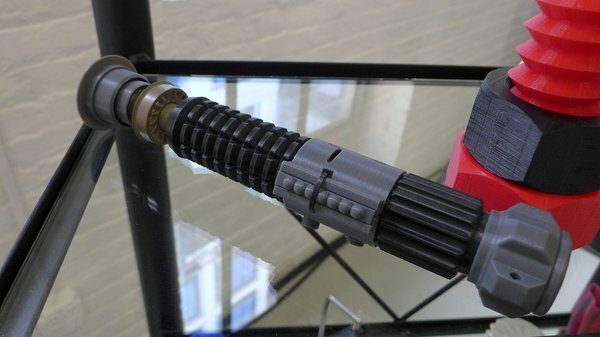 Valcrow's lightsaber made on a Printrbot. 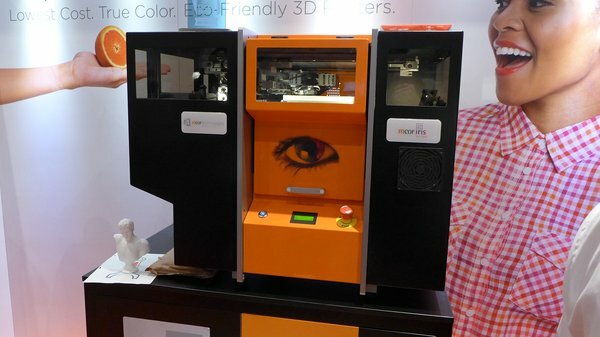 I wrote about the unique Mcor IRIS SDL (Selective Deposition Lamination) printer last year and stopped by their booth for an update on their interesting print tech. As a refresher, the Mcor machines cut the layers of a model out of standard printer paper and glues them together to form 3D prints. The IRIS uses proprietary inks to add full color detail, to the models. This year, the IRIS has been updated to the IRIS HD with an improved, carbide cutting tip and revamped color mapping technology, to improve color accuracy and sharpen details, while also reducing the amount of ink used. Finished prints can be sealed for strength or coated in a new semi-flexible coating. For those not familiar, the 3Doodler is, basically, a handheld hotend, like on an FFF printer, that allows you to extrude plastic, freehand, to make sculptures, amongst other possibilities. 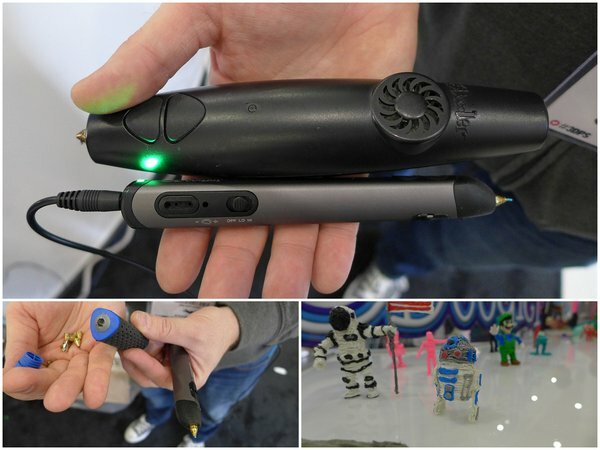 I have to confess - when the 3Doodler came out last year, after a successful Kickstarter, I was skeptical. It was big and clunky and I felt the novelty of making squiggly sculptures would wear out quickly, especially considering the cost. . A year later, and we now have v2 and I have to say, it's a big upgrade. Due out this month for $100, version 2 has been slimmed down considerably, features forward and reverse for unloading, a hi/lo temperature control, a fast, slow or continuous feed setting and the ability to run off battery. Typically, the 3Doodler is run off AC and prints with a stick of ABS, PLA or flex material fed in the back. With the battery pack add-on ($40), there is now the option of running 2-3 hours 'cordless', depending on the heat setting. There is also a nozzle set available ($20), for different extrusion options and they come in a nice carry case, with integrated wrench, for installation. While you can technically use any ABS or PLA plastic, they highly recommend using their packs since the curvature of filament off a spool can cause feed problems; this seems like a valid concern. A variety of colors and materials are available for $10 per 25 sticks. A legit use for 'pros' occurred to me, which is to use the pen to repair, modify or join actual 3D prints. I was pleased to hear, that 3Doodler agrees and is embracing that aspet, to draw in a bigger user base. We hope to get our hands on a v2 3Doodler and report back. Tinkerine, maker of the nice DittoPro, FFF printer is doing something really cool - Tinkerine U - an attempt to give users something more to do with their printer than printing do-dads. Tinkerine U has lesson plans that use 3D prints and sometimes actual hardware to not only teach about 3D printers, but anything from optics to topography. 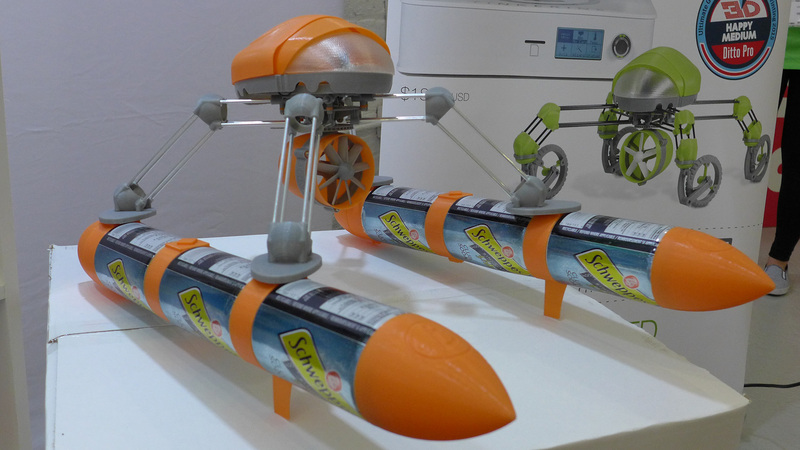 It's free to sign up and download STL files (not proprietary) and instructions to build some pretty cool stuff, like air boats and gliders. I appreciate that most of these projects use multiple printed parts, combined with real hardware - something I'm a big fan of. They provide full instructions, including print settings and a hardware list. 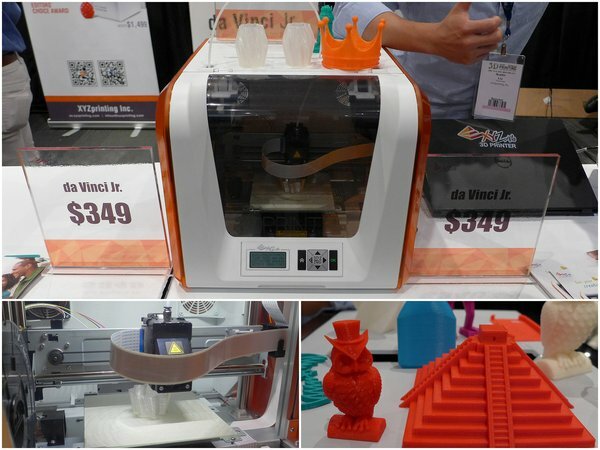 Tinkerine plans to offer the needed hardware for sale, although most of it is easily obtained elsewhere, but it's nice to have a one-stop shop. I've been seeing Taiwanese, XYZ Printing everywhere over the last year and they are really cranking out machines at a great price. Last year, I took a look at their 3 FFF machines and while they seemed nice, the print quality was lacking. They have added more to their da Vinci line including the AiO - a printer with a built-in scanner and the Plus, with large print volume. The Jr. sells for only $349 and is advertised as a simple, beginner PLA printer. The print quality seemed to have improved from last year and they are trying to make an easy-to-use system which includes proprietary, chipped filament cartridges that keeps track of how much filament is left. They are also introducing their own SLA printer, the Nobel, this summer. It's basically a Form 1+ knockoff with similar specs, priced at $1499. It has an auto-refill system for the resin, which is nice, but the print quality was not quite up to par. I feel like XYZ is trying to do too many things, but at the price point, they're worth keeping an eye on. I was excited to talk to Tom Pasterik of ExOne printing out of Pittsburgh, PA since they specialize in metal 3D printing. If you have followed my build of the Millenbaugh Motivator, for Adam's Hellboy Mecha-Hand, you will know, that the crankshaft has been problematic. The original was printed in plastic, on an SLA machine and while it worked, there was too much flex and it quickly broke. I printed a metal version with Shapeways and while it only cost $15, the tolerances were way off and it printed more than 1.5mm shorter than normal and was slightly warped. I priced out printing it professionally, which came in over $200 for one--out of the question. It has become my White Whale and I've been looking at other non-3D-printed options as well. ExOne has been around for over 20 years and is a professional/industrial company that is trying to tap into the consumer market, so I was able to print an accurate crankshaft at a reasonable price. I'm in the process of installing and testing the new crankshaft and updates will be forthcoming. I've mentioned EnvisionTEC before, when we talked about printing with resin, and they remain one of my favorite high-end printers for quality parts. EnvsionTEC typically uses DLP (Digital Light Processing) machines that instantly cure each layer of resin using a digital projector, rather than 'drawing' the layer, using a laser, like SLA (Stereolithography) machines. DLP machines are capable of very fine layers, down to 25 microns (.025mm) but typically have a smaller print bed. Last year, EnvisionTEC introduced their take on SLA printing with 3SP (Scan, Spin, Selectively Photocure) technology, which incorporates additional lenses and mirrors compared to typical SLA printers. Normally, SLA printers can suffer accuracy problems on the outer edges of the print bed, due to the laser hitting the resin at more of an angle, rather than head-on like in the middle of the bed. 3SP technology uses an octagonal mirror and 'theta' lenses to compensate for this distortion and achieves higher accuracy across the print bed. I suspect EnvisionTEC delved into SLA printing to offer larger print capacities as their 3SP machines can go up to 508mm x 508mm x 508mm, versus their largest DLP machine with a capacity of 192mm x 120mm x 230. 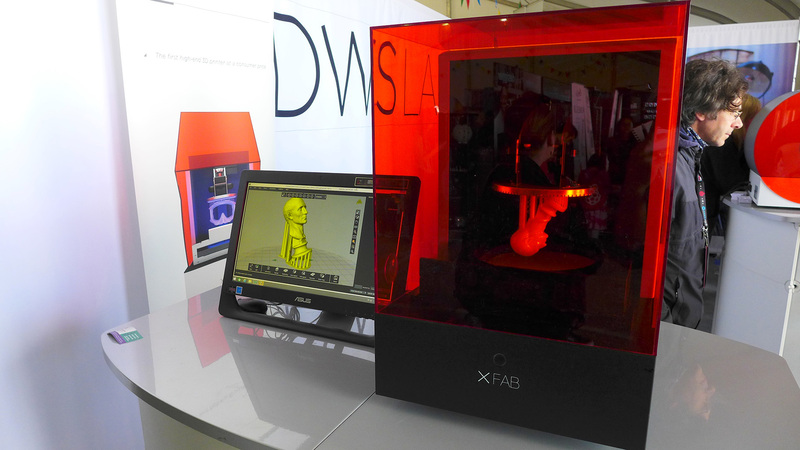 The new printer that intrigues me the most is the XFAB SLA printer from Digital Wax Systems out of Italy. DWS Labs was founded in 2007 to make high-end SLA machines and the XFAB is their foray into the consumer market. I have reviewed the Form 1+, which is the closest comparison, so let's take a quick, side-by-side look. The XFAB is a significantly bigger machine, but adds 55mm to the print dimensions while also capable of thinner layers and resolving finer details (min. feature size). Materials cost the same, but I believe the XFAB uses a sealed tank, so no direct contact with the material occurs. XFAB offers a few more materials, with a nice, soft, rubber-like material as a stand-out. Formlabs has also introduced a flexible material, which is stiffer than what DWS is offering. According to the specs, the XFAB is capable of even finer resolution than the Form 1+ and I have to say, the prints displayed were very good. It will be interesting to see what happens with the XFAB, and if the extra cost is worth it. It's worth mentioning, that the Form 1+ comes with a complete cleaning station, while it seems that the XFAB does not. DWS is also based in Italy, so shipping and technical support is something to consider as well. The XFAB is slated to be released toward the end of September 2015 for $5000 and DWS Labs has indicated that they are developing a mini version for around $2500. Whew. 3D printing technologies are still advancing at a rapid pace, and it's getting harder to keep up with everything. It will be interesting to see what comes our way, especially with prices continuing to drop and quality continuing to improve and machines now available at Home Depot and Staples. 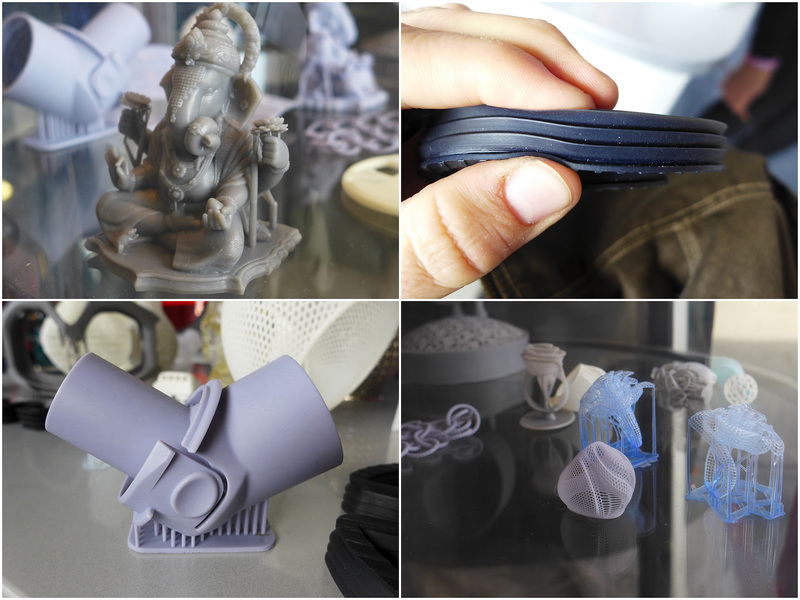 Have no fear, we'll do our best to keep you updated on the latest updates in 3D printing!